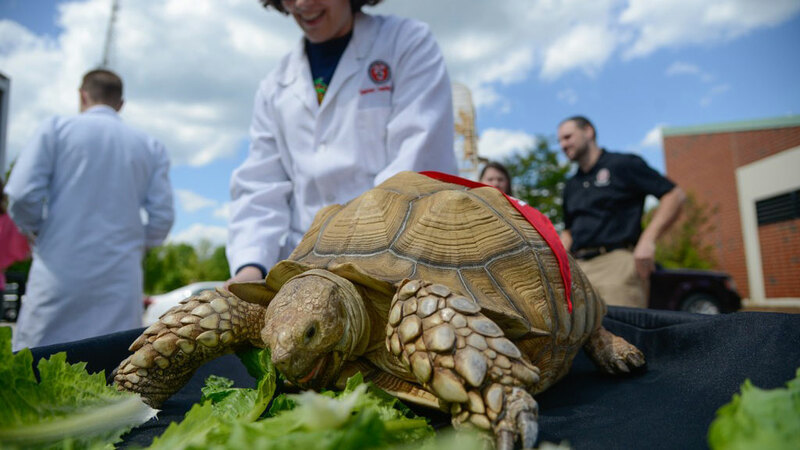 A ten-year-old turtle got its fill of lettuce during gift announcement. When Rob Loose graduates from NC State’s College of Veterinary Medicine next month, a position in a small-animal general practice awaits him. He feels ready to succeed there, thanks to the innovative education and medical research, advanced technology and quality of animal care that the college is known for－excellence that is largely possible due to private funding. Even Loose’s future job came about because of philanthropy, through a contact made at a conference that his scholarship allowed him to attend. “I’ve been able to learn more, meet more people and really get a better idea of where our profession is headed,” said Loose, a Randall B. Terry Jr. Leadership in Veterinary Medicine Scholarship recipient. Now, even more students will get the same kinds of opportunities. The R.B. Terry Charitable Foundation has pledged $16 million to support scholarships, faculty and research endowments within the College of Veterinary Medicine. This generous gift－which will effectively double the student scholarship endowment, among other impacts－furthers a visionary legacy through which the foundation, formed by the late Randall B. Terry, Jr., has made significant investments in the college over the years. In 2005, the Terry Foundation committed funding to help build the Randall B. Terry, Jr. Companion Animal Veterinary Medical Center. Today, the Terry Center epitomizes the late philanthropist’s understanding of the bond between companion animals and owners, as well as NC State’s think-and-do philosophy. “Animals give so much to mankind, it’s only fitting that we give back something to them,” Terry once said. Every year at the College of Veterinary Medicine, thousands of animals receive outstanding and compassionate care, the next generation of leading veterinarians and scientists emerges, and innovative research pushes the boundaries of animal－and human－healthcare. “The college as a whole has a spectacular reputation and that was something that I really wanted to be a part of,” Loose said. Ranked third in the nation (by U.S. News & World Report), NC State’s College of Veterinary Medicine has been influenced by the Terry legacy in many ways. While much of the Terry Foundation’s previous financial support has contributed to exemplary facilities, including equipment and technology, the most recent gift largely will further the foundation’s support of the people who use those facilities. “It is often the vision and commitment of our donors and their philanthropy that allow us to go beyond what is expected and reach the peaks of accomplishment,” Lunn said. Graduating 80 to 100 doctors of veterinary medicine each year, the college boasts some of the lowest in-state tuition and fees of any veterinary medicine institution in the country. Coupled with lower-than-average student debt, the R.B. Terry Charitable Foundation’s gift serves as a strong recruitment tool for the college. Gibson and Loose are just two of many CVM students and faculty－not to mention animals－whose lives have been impacted by the Terry Foundation.